So I have just purchased some more paper to do more paintngs on 300 gsm cold pressed watercolour paper. 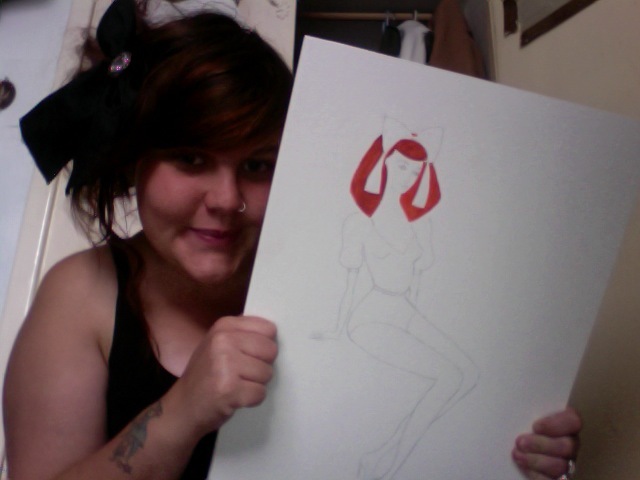 I am currently drawing a lady with a bow on her hair she hasn’t got a name yet but i’ll give it time. She kinda looks like a Ginger lady Gaga but my illustration has little bit more clothes on here body then the lovely Gaga not many but some. I really hope that everyone who reads or just looks at my illustrations has as much fun observing them as i do Drawing them. I have had a fews ideas on what i want to expand my illustrations into. I dont want to just stick with making prints of my work i want to create tea cups and jewellery does this appeal to anyone? I think lockets with my illustrations on? I really want to get back into making my Unique custom Jewellery but i dont think i have the time? I had an interview today for harrods and i got through to the next round of interviews and the lady that interviewed me was absoultley adorable i had her wrapped around my little finger haha i say that now i wont get the job Oh dear HA! So there is only two days left to Enter my Ella Masters Give away and i am really excited to find out who is going to win one of my necklaces, i have never actually done a give away before so i am pretty excited i really hope everyone that is involved in winning likes what they recive. You must be a follower of Ella Masters to enter please remember this I wont put anyone who has entered and is not following into the prize draw. I was told by Sofia of Sofia’s Journal that she was having trouble seeing the thumbnails on my Etsy site i wondered if anyone else had this issue with the site? Next Post Rolls of Film for SALE! I can see the tumbnails lovely! Oh wow, I love your blog. I follow a few illustration blogs and it's refreshing to see pretty watercolours!